My name is Jon Clayton. 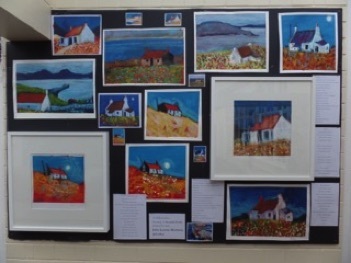 I am an arts coordinator based at Kelsall Primary School in Cheshire, although I also run art workshops, teacher insets and twilights in other schools in the area. I been a great admirer of your work for many years now, first getting to know your paintings from many and regular visits to the west coast of Scotland - staying on most of the islands and particularly on the Mull of Kyntyre near Kilberry. Like many others I love your use of colour and sense of place you create, often of quite familiar scenes. At Kelsall the year 5 (ages 9-10), with their class teacher Jo Morris - also a regular visitor to the West Coast and Islands- have just come to end of a class topic on Scotland with a focus on the Highland Clearances. 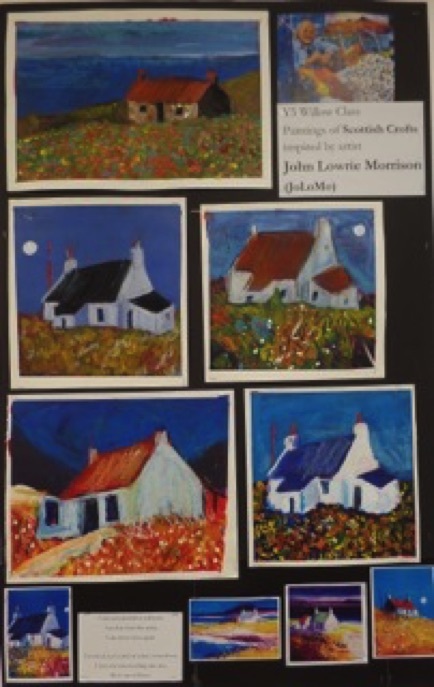 To accompany this topic we have been looking at your paintings -particularly those with crofts as part of the subject - and the children have been attempting to paint in a 'Jolomo' style. 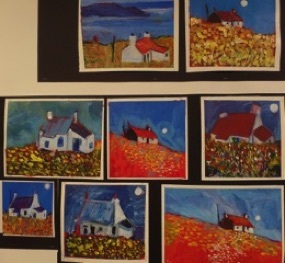 Some are straight 'copy'/interpretations some are paintings from photos/sketches of croft houses which children have painted 'with you in mind'. We have used acrylics with oil pastels on thick card in the attached pics, though will be developing ideas on canvas.